Dr. Ruff actually hosted her own radio show called “Healthview,” in which she interviewed doctors of various disciplines and asked them about health tips as well as the latest advancements in treatment. Dr. Ruff is often able to connect oral health to a wide array of seemingly unrelated health topics, showing both listeners and the guest just how important taking care of the smile really is to overall wellbeing. You can listen to some of her most popular interviews below! Dr. Kenneth Rich: What Does a Neurosurgeon Do? Our practice was recently featured on the cover of "Dental Economics," a nationally syndicated magazine. 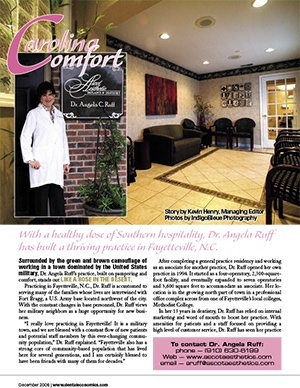 Click below to read what their editor had to say about Dr. Ruff and the staff.